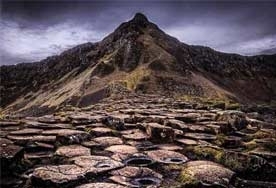 'Giant's Causeway Sunset' is an open edition photographic print by Alastair Stockman. A beautifully calm evening at the Causeway Coast as the sun slips behind the clouds. Warm blue colour of the clear sky beyond the clouds.